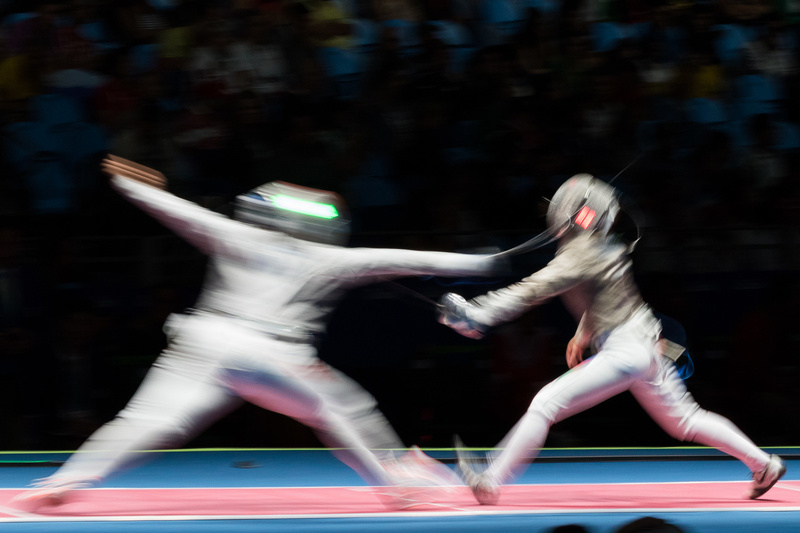 When it comes to Olympic venues no other event goes so far to create such a theatrical experience for the attendees while also making for some of the most dynamic Olympic photographs as fencing. Before the Rio 2016 Olympics I had never been to a fencing event. Not only had I never been to one but I had really never even seen one on TV. Sure I knew what fencing was and the basics. It pops up in shows and movies so I’m sure like most people I thought I knew what it looked like. This was the extent of my fencing experience going into Rio. As a photographer you don't always get to choose the events or when you cover them. You get your assignments and if you're lucky you can fit some extra events into your schedule. Everyone has their favorite Olympic events and ones they probably just don't see the appeal in. For me Track and Field will always be my priority event. I ran in High school and College and still actively follow the major events. 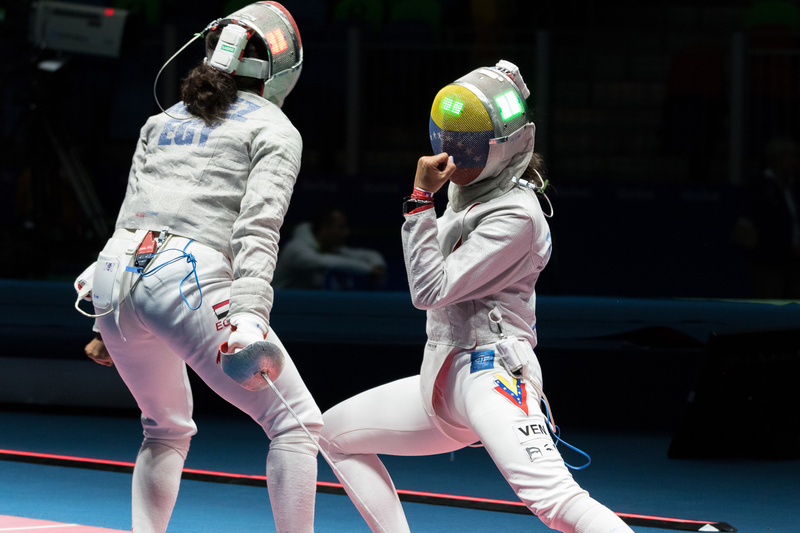 Women's fencing was one of the events I was assigned to cover in Rio and not one I was very interested in on a personal level. Reflecting back on the experience I think I’d say it was one of my favorite events and I wouldn't hesitate to cover fencing again. When you first enter the Carioca Arena 3 you quickly realize it's unlike any of the other brightly lit Olympic venues. The stadium lighting is dimmed leaving the audience darker than the center stage. The stage lighting on the fencers is considerably brighter very similar to theatrical lighting making it feel like you're at a show. To me it brought back memories of going to the circus as a kid. Even the stage itself had more of a presentation to it. The stage was shaped in a giant X dividing up four different sections for matches with one larger section in the middle. Each section had its own color and corresponding monitors for the matches. It had the design and feel of the much showier stages at the X-games. Within each individual section the match scoring was indicated by several different LED displays. Along the colored piste (match surface) were LED running lights, on each side of the stage platform were large LED sections, and to take the theatrical atmosphere to its limit the fencers masks themselves had LEDs on top. All of these LEDs would light up every time contact was made all just one more visually appealing feature for what seemed like just the audience's sake. Once the matches started I was in for another surprise. 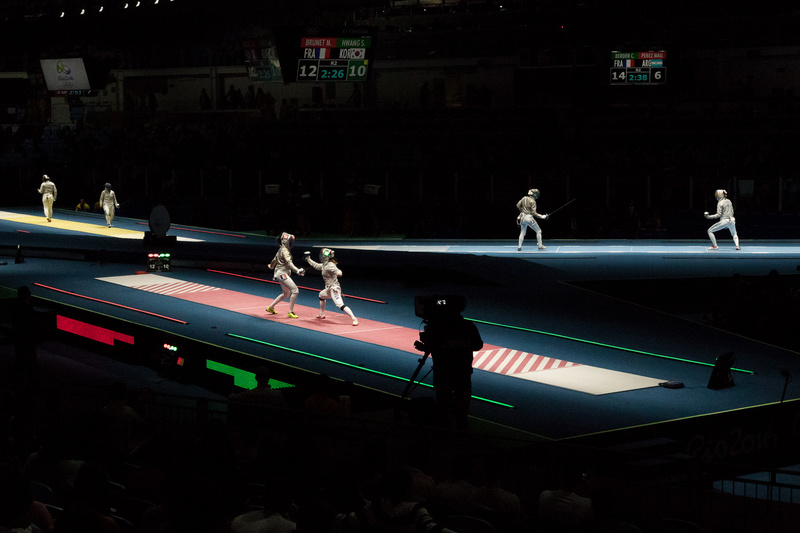 Not only was the venues lighting beautifully lit for photography but the fencers themselves were so acrobatic in their attacks and dodges that it was as if you were watching some amazing choreographed light saber battle in Star Wars. My assignment was Women's Individual Sabre. I can only assume the Men’s fencing is just as interesting however the level of acrobatics in the women’s matches seems unlikely to be matched by the men. 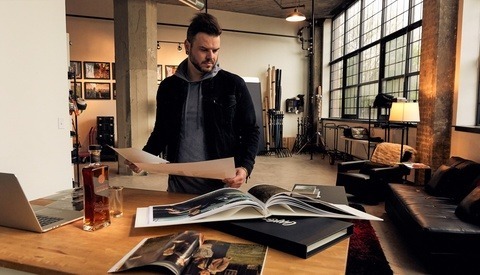 As a photographer you could probably close your eyes, press the shutter, and capture an amazing moment. In fact I shot so many photos that in any single lunge or parry editing down to my favorite images was the most difficult part of shooting fencing. I was having so much fun and shooting tons that I was able to try and experiment with some of the matches I wasn't there to cover. Before I had arrived at the arena there was a single image I envisioned in my head. 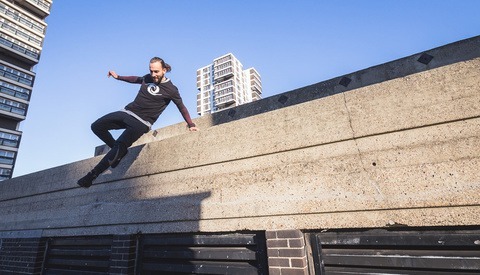 As I started experimenting I made several attempts at trying to slow the shutter and get that beautiful motion of a lunge. I had done this many times during Athletics events and a few other sports but not knowing enough about fencing and the different style and timing turned out to be a bit more difficult. I definitely didn't master the concept but I think I got a couple of more artsy shots that I’m happy with. To top everything off if the amazing lighting and beautiful dance like acrobatics didn't sell you on fencing. 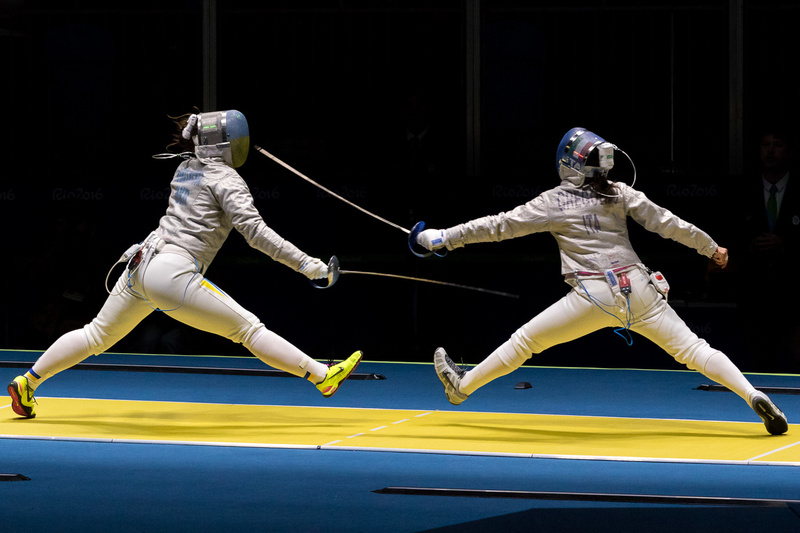 After each scored point both fencers would release a burst of emotion and energy in a scream. This was done almost every match by both sides win or lose. 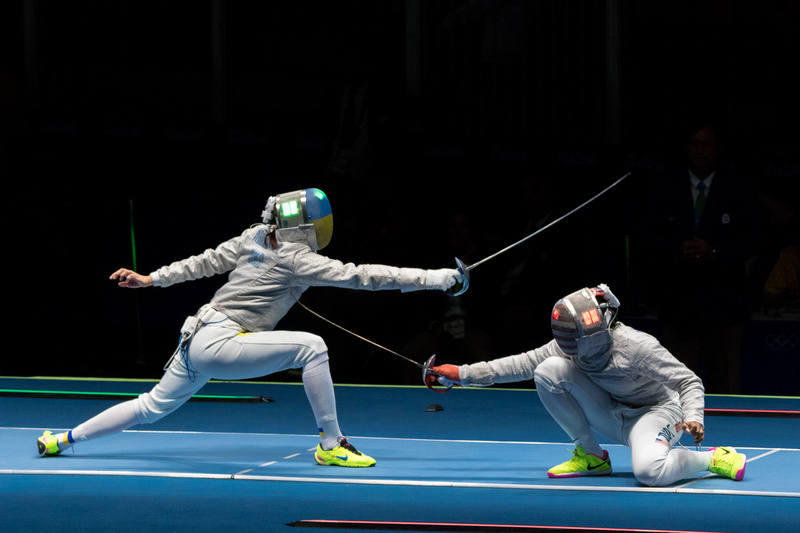 For someone not very familiar with how fencing is scored this along with the LED lighting and quick pace of the matches made it difficult to tell which fencer actually scored a point. I found myself constantly glancing at the scoreboards trying to figure it all out. While at the Fencing matches I was lucky enough to get to see Ibtihaj Muhammad compete in several matches. Ibtihaj made headlines early as a Muslim Women on Team USA and for being the first US Muslim to compete while wearing a hijab. 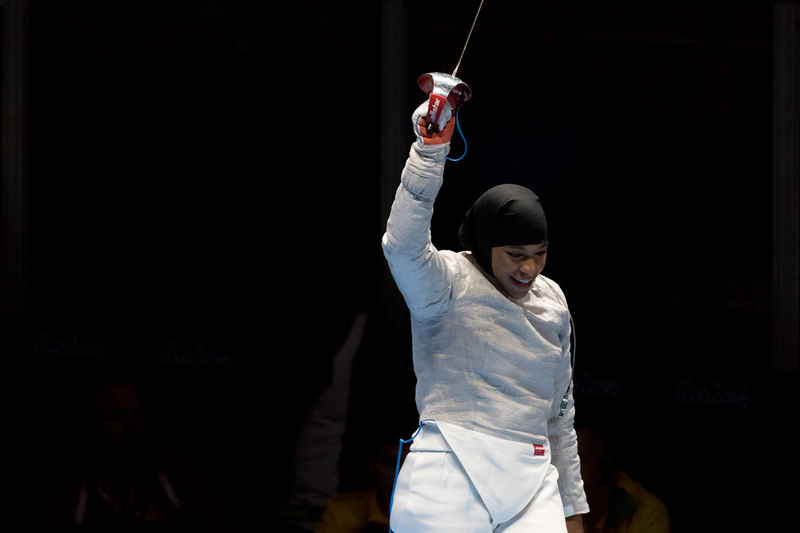 She also became the first Muslim-American Athlete to win an Olympic medal taking the bronze in the team Sabre. The importance of that aside she did an amazing job in the matches I watched and her friends and family who were there for support really represented the USA in a great way. Earlier this year I shot the 2016 North American Cup in St. Louis which was a US Fencing event and qualifying competition for the Olympics. 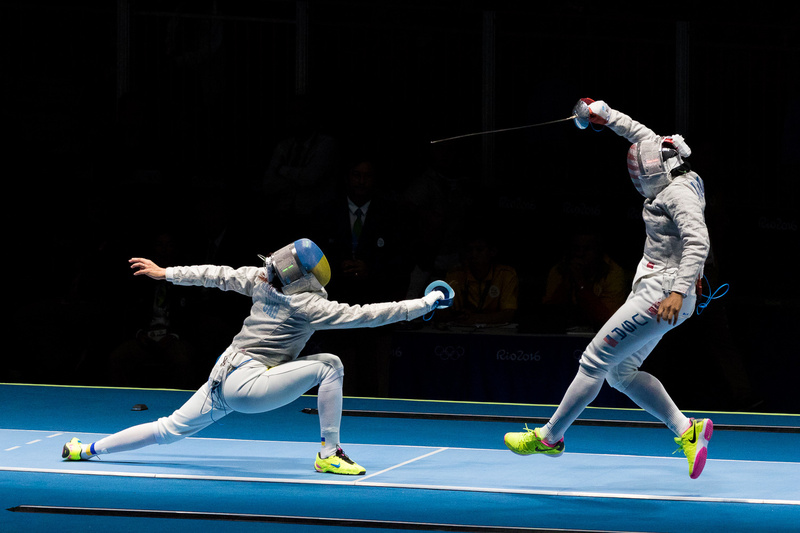 It was different levels of competition - men, women, juniors and wheelchair fencing. Former Olympian winners were there competing for a spot on the Olympic team. It was a great event. Too many photos to choose from! On the surface fencing takes a lot of energy. But the sport at the higher levels is all about deception. 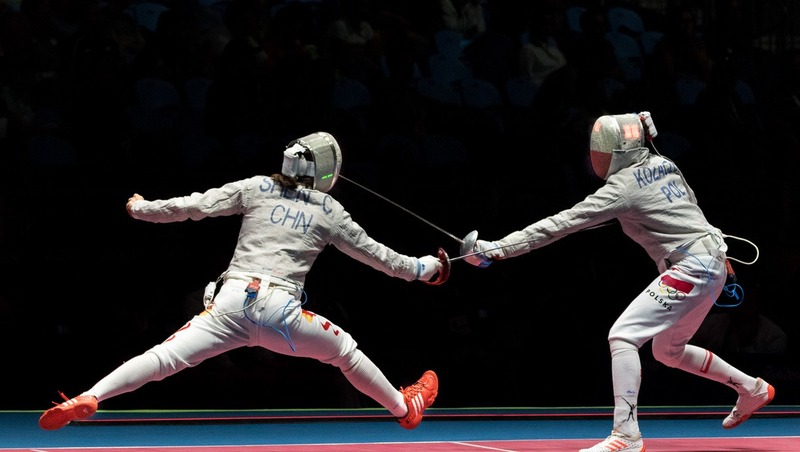 The action is very quick and the indicators can be as small as a fencer lifting his toes or tightening his grip. When you see the deceptions, the action or actions will come... in the blink of your eye. Not unlike everything else in photography, timing is everything. Beautiful shots. 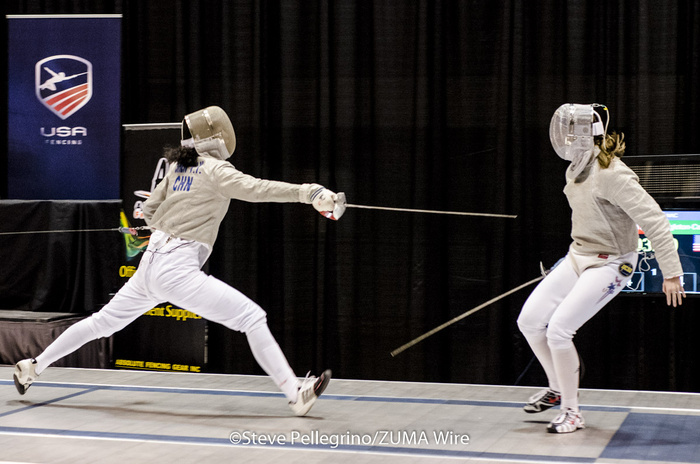 I've been shooting fencing as an amateur for a few years. 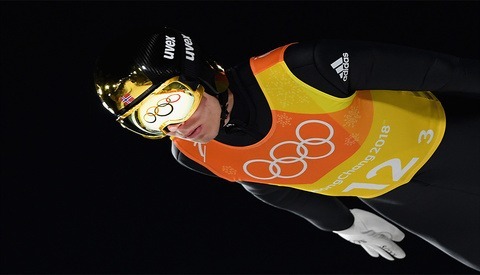 Shooting the sport at the olympics would be a dream. You got some great shots. If you are interested, check out my fencing insta at @dieselnyc1. Beautiful display of the action, how did Tsinis loose his mask? Thank you. The velcro on the strap behind his head failed. Pretty scary as you might imagine.